For pier and beam structures we will inspect the current structure's piers. If only jacking and leveling is required, we will simply lift the structure up at each pier location and place shims to level the structure. 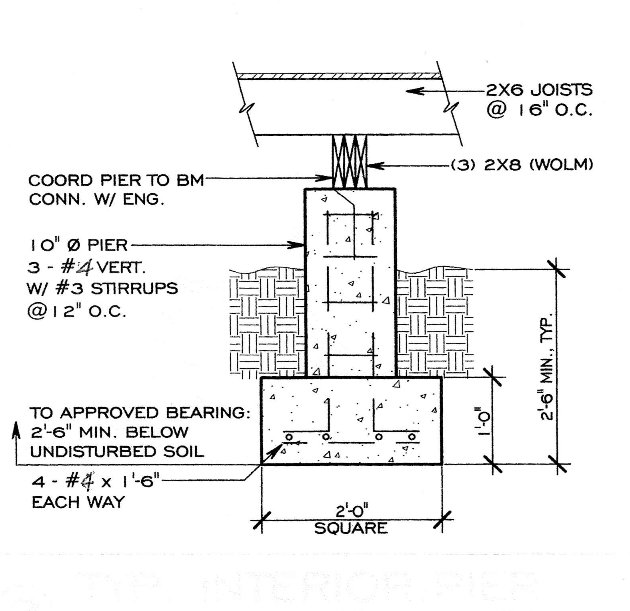 If the current piers are rotted or unstable, they will need to be replaced. Any rotted wood or beams will also be replaced. We will first put shoring in place to temporarily stabilize the structure. We will then dig a 2x2x2 foot hole for the new pier locations. After the concrete footings have set, the structure will be lifted and leveled and the plinth (the top of the pier) will be poured onto the footings. After the pier has set the new piers will be poured right to the bottom of the beams. The new foundation is now structurally stable on its own and the temporary shoring is removed. We completely clean up any debris from the site. We replant any plants that might have been removed. We will also remove and replace underpins if needed.